Site integration is the process describing how to configure and set up a site with Apptus eSales. The core building blocks to supply a site with rendered content from Apptus eSales are called Panels. Apptus eSales provides a library of over 30 predefined panels where each panel type supports a specific use-case. Panel availability is dependent on what features of Apptus eSales a customer has decided to use in their implementation. The panels are used to build a content structure for each page. As each panel display and return different data it is important to connect the use-case to the desired result. Incorrectly used or configured panels may render a desired result on the site, but the behaviour data sent back to Apptus eSales could be invalid for the panel behaviour algorithms. The data sent back to Apptus eSales are called notifications. These notifications track visitor interaction with panels and content, and are used to help Apptus eSales improve recommendations, personalisation, search results, and more. To render any content from Apptus eSales on a website, the data entity type attributes and panels that will be used must be further configured and published. Basically, the retailer will build their own API from Apptus eSales. Once the data entity type attributes are configured for panels to use, a panel hierarchy can be created. A panel hierarchy should correspond to the intended structure of the different pages of the site. This hierarchy may contain not only standalone result panels but also Zones. Zones are panels that can contain child panels. The main advantage with using zones is that the data used to render a single page can be retrieved in one request instead of several. Apptus eSales not only renders content based on what panel configuration is present on a page but also on behaviour data. To show personalised content, Apptus eSales must identify visitors as either new or returning. The retailer must decide what level of personalisation their implementation will use. The different levels define how visitor sessions are set up and are based on expected usage scenarios of a site. This setting yields different results in content presentation for new and returning visitors. The finished page structures with configured panels and zones are published and queried through the Web API for rendering on a site. Before sending any queries to Apptus eSales the data entity attributes that have been imported must be configured. 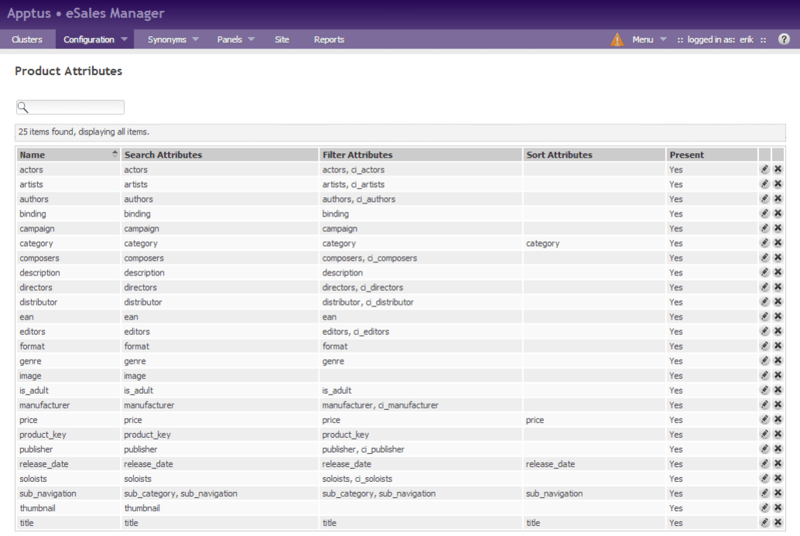 All attribute configuration for data entities and arguments for panels are made in the Apptus eSales Manager. Product attributes must be set, including attributes for search, filtering, and sorting. Search attributes are used for panels that produce search, autocomplete, or did-you-mean results. Filter attributes must be defined for every attribute that should be used to filter the product or ad catalogue. Filtering can for instance be used to only show products in stock or products with pictures. In order to sort on a product attribute, a sort attribute must be defined. Attributes can be formatted in different ways including comma separated lists, paths, pipe separated lists, and pipe (or comma) separated list of paths. Category reference attributes must be in the form of a comma-separated list. Panel arguments is a way of telling a panel what it should do on a site. 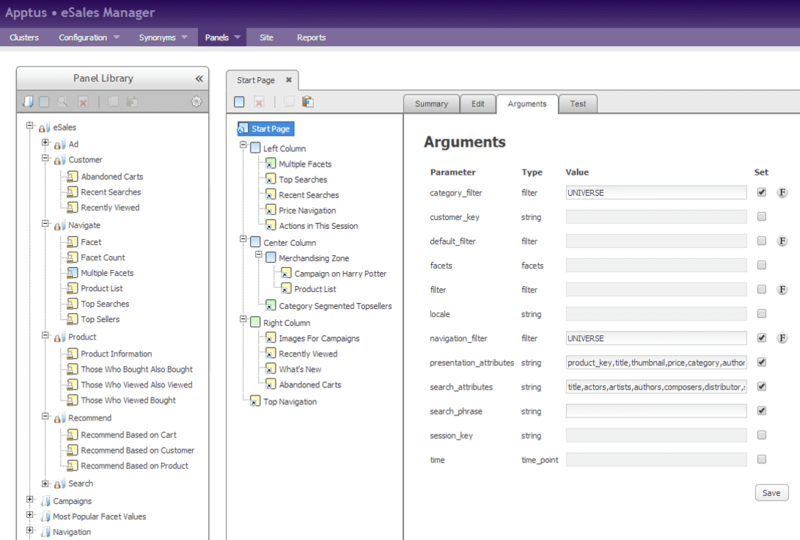 Arguments can either be pre-configured by the panel configuration that is used or set by a query. A combination of query and pre-configuration can be used. Several types of arguments can be used with panels including facet filtering, sorting, and search phrases. There are several notification types that Apptus eSales handles to provide accurate visitor recommendations and supply reports to the retailer. Notifications are ideally sent from the visitor client. Each part of an Apptus eSales panel (including products and ads) have a unique identifying ticket. This enables Apptus eSales to connect visitor interactions, such as clicking on a product in a result or adding a product to a cart, to what panel that led to that conversion. The more notifications sent into Apptus eSales, the more it will learn from the visitor behaviour and provide better content as result. Categories also have tickets, but it is not necessary to explicitly notify clicks on them. How a visitor is identified and tracked during a session is determined by how the session is managed and implemented. This is based on the level of personalisation as decided by the retailer.